← Wednesday on the Low Carb Cruise – We’re in Jamaica, Mon! Today was fun! Kinda! Yes, if I keep saying it – it will be! Actually it really was fun – I’m just a tiny bit the worse for wear. We arrived at Grand Cayman this morning, seven-ish, while we were having breakfast in the Main Dining Room. Howard had his normal lox and cream cheese, and I had my Eggs Benedict. I think I’ve had enough of that now, and I’m ready to go back to cottage cheese. Cottage cheese is one of my favorite foods in the world! 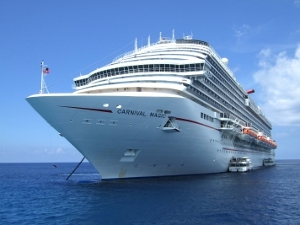 Grand Cayman is a tender port, meaning we weren’t able to dock at the port. Instead, the ship anchored offshore, and tender boats were used to transport passengers to the actual dock. We thought there might be long lines for the tenders, and the announcement said to go to Ocean Plaza on Deck 5, for those who didn’t have an excursion planned, so that is what we did. Actually when we arrived on Deck 5, we were directed immediately to the elevators to head on down to Deck Zero and we got on a tender immediately. Off we went for the short ride to the dock, where we did our normal “rounds” of Grand Cayman. We met up with our new friend, Andrew Dimino (translated, that means that Andrew didn’t see us in time to escape our clutches, and so he walked and visited with us for a little while). 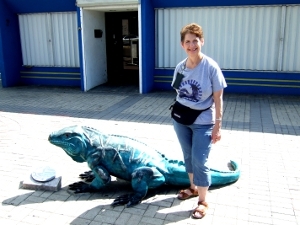 We arrived at one of the island’s well-known iguana statues downtown, and Howard suggested taking my picture. I decided to be all cool and graceful, and figured I’d give the picture a little “interest” by sitting on the iguana’s tail. Well, I am so glad we weren’t using the movie camera because I barely landed on the iguana’s tail before I found myself rolling on the sidewalk. Something threw me completely off-balance, and I still don’t know how it happened so fast! Andrew, ever the gentleman, managed to not laugh out loud at me, and at least appeared to be concerned for my welfare. While Howard was helping me up, Andrew was formulating a reason to take off, and I can’t say I blame him. We didn’t see Andrew again for the rest of the day, and indeed he wasn’t even at his normal table at dinner. I sure hope he made it back okay, but I’m certain he did, or someone would have asked about him. After the iguana fiasco, we did some shopping in the district. Grand Cayman is a British protectorate, and as such, is both cleaner and more expensive a town than the other Caribbean ports. Many of the downtown buildings are banks. For many years, Grand Cayman has been an offshore haven for people wanting to hide their money from the Internal Revenue Service. According to new regulations and pressure applied by the United States, I understand that offshore accounts aren’t as anonymous as they used to be, and therefore, are much less attractive to Americans. Howard wanted me to wear it to the VIP cocktail party, but I was way too unsure of myself to wear the dress to a public occasion, so I wore my boring “elegant night” outfit to the party, and subsequently to dinner. Imagine my surprise when our tablemate Jenna, the 7th grade daughter of one of our low carb cruise members, showed up at dinner….in the same dress as the one I bought! It definitely looked better on her than it ever will on me! Tomorrow’s the final port day. We’ll be in Cozumel all day, then head back home all day Saturday. We have a couple of interesting interviews scheduled for tomorrow afternoon – we’ll be letting you in on those when they’re ready! 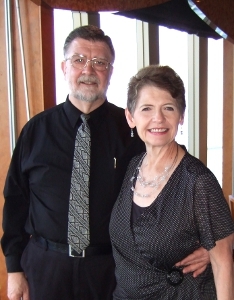 This entry was posted in Diet, Fitness, Health, Low Carb Cruising! and tagged Caribbean, Cayman Islands, Cozumel, fiasco, Grand Cayman, Howard, iguana statue, Internal Revenue Service, tenders. Bookmark the permalink.